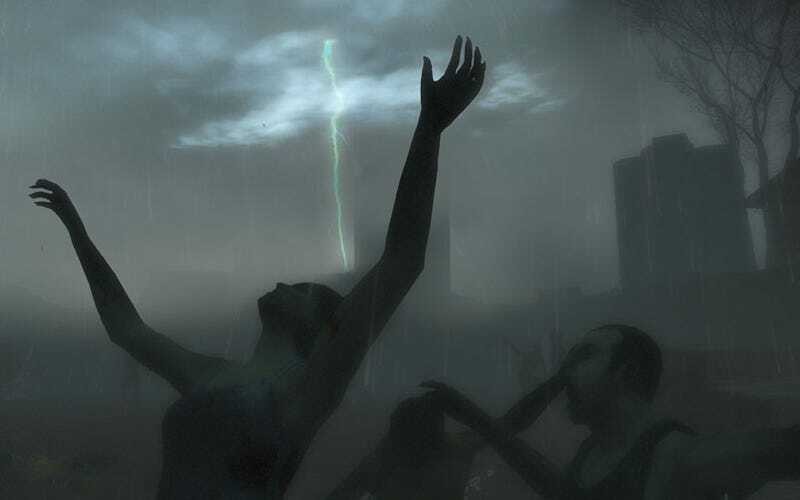 Valve Brings Left 4 Dead 2 To Comic-Con, Reveals "Swamp Fever"
Electronic Arts and Valve will be revealing all-new Left 4 Dead 2 content at this year's San Diego Comic-Con, including the new campaign "Swamp Fever," darkly pictured above. Where and when can you play it? The "where" is the EA Gaming Lounge Presented by Xbox 360 at the Hilton San Diego Gaslamp Quarter Hotel. The "when" is 2-9 pm Thursday through Saturday, and 12-5 pm on Sunday, which means you'll need to miss out on valuable Con time—but will more than likely be worth it. Should you not have the means to make it to Comic-Con this year, we'll be going hands-on with Left 4 Dead 2 on the Wednesday before Comic-Con kicks off officially. Valve promises to not only show off the second of five campaigns featured in L4D2, but also "a few more of the 20-plus new items" that will be included in the sequel. Oh, that picture plumps when you click it, should you feel like squinting very hard for any details.